Happy Friday! 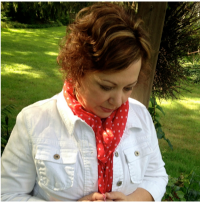 A few weeks ago I got together with my friend, Cindy! She is the best cook/baker I know! She makes her own bread and cans pickles, salsa, applesauce, etc. She turned me onto The Great British Bakeoff – and now I’m a crazy fan of this show! At this time of year, there are so many wonderful pumpkin recipes to bake. I usually stock up on my cans of Libby’s, but not Cindy! She makes her own pumpkin puree and has been trying to convert me for a few years now! So, we got together at her home where she showed me how to make fresh pumpkin puree. 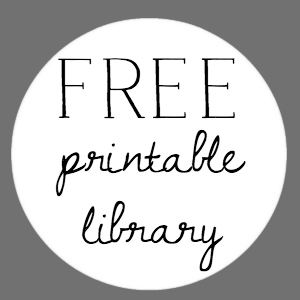 It really is easy, inexpensive, and is fresh and organic! Of course, I took my camera with me so I could show you the steps! First, you need a neck pumpkin. They are light orange and have a long neck! Cut off the top, where the stem is. Line two baking trays with tin foil. Cut the pumpkin in half length wise. Then cut those two pieces in half. 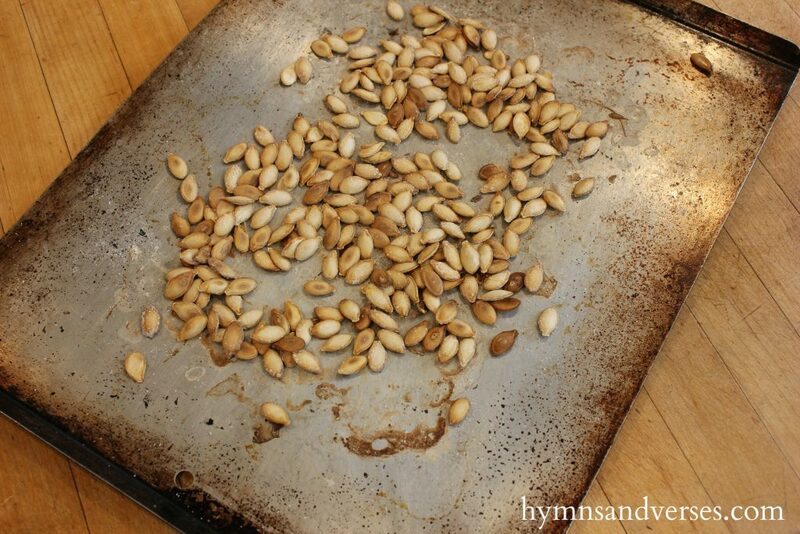 Scoop out the stringy pulp and seeds and place the pumpkin pieces face down on the foil lined baking pans. Rinse off the seeds and set them aside for roasting. 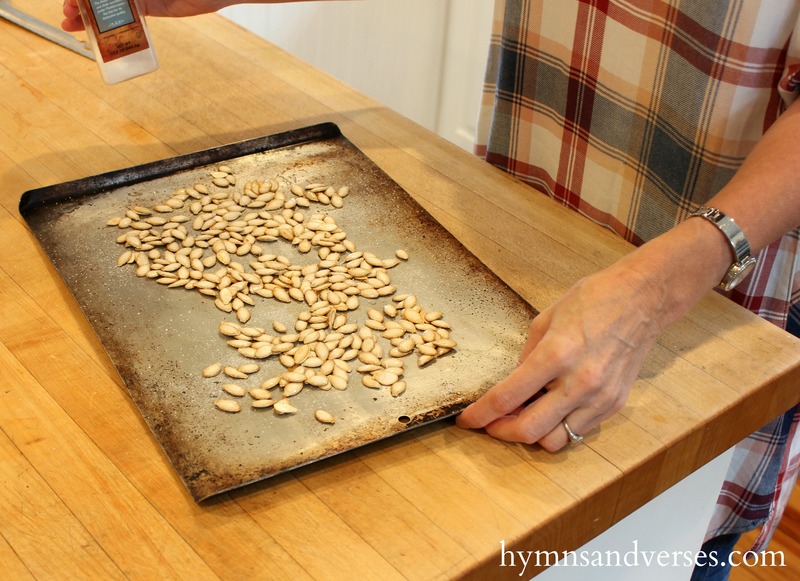 Place the trays in a 400 degree preheated oven and roast for 30 – 45 minutes (until a fork can easily be inserted into the pumpkin). Let the pumpkins cool a bit. Scoop out the pumpkin, leaving the skin, and place in a bowl. 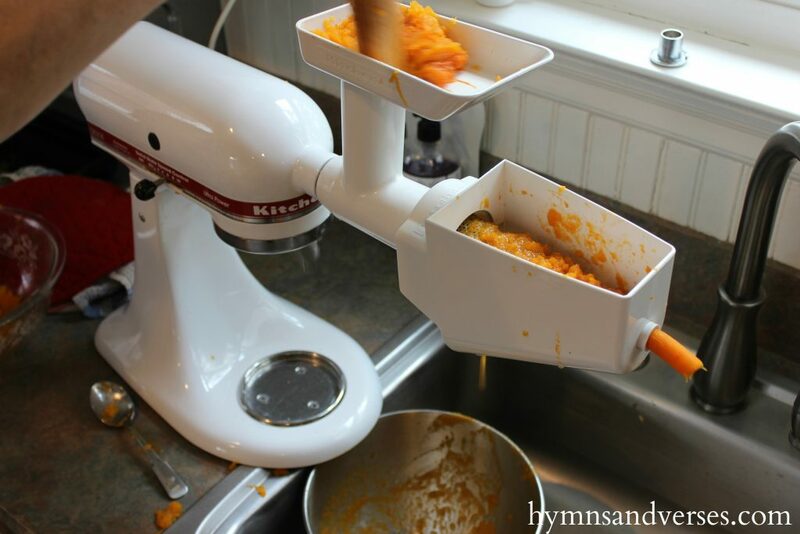 Cindy uses her KitchenAid Mixer with THIS food grinder attachment to turn the roasted pumpkin into puree. She also uses this attachment for applesauce. It makes applesauce making so easy because you just cut the apples and steam them until soft (skins, stems, seeds and all)! The food grinder takes all of those things and spits them out leaving you with smooth applesauce! It’s amazing!!! But, back to pumpkin puree. In the photo below, you can see the food grinder attached to Cindy’s mixer (I can’t help mention how much I love her white with red accent mixer!). Set your mixer up on your kitchen counter with the attachment extending over your sink bowl. 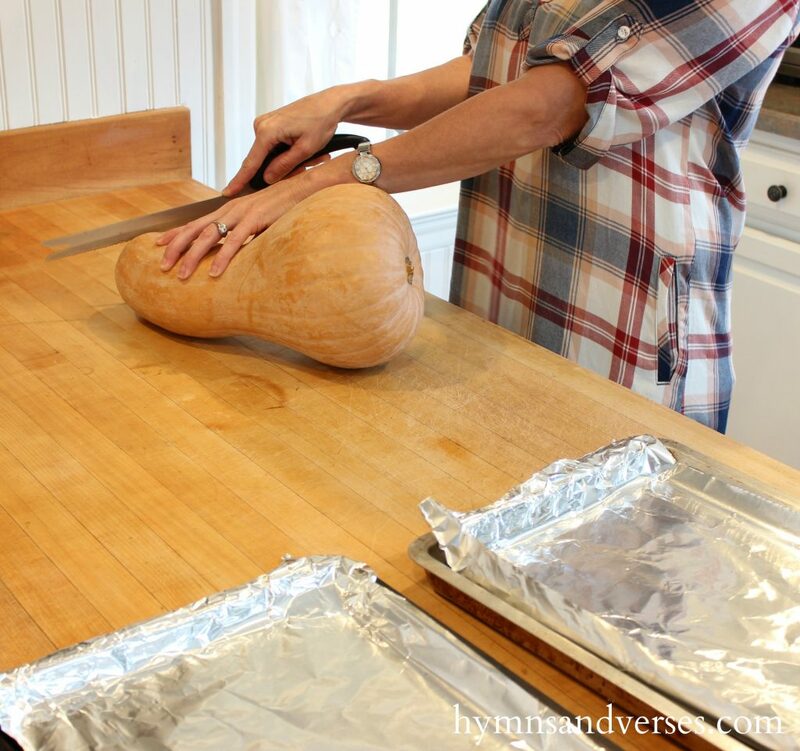 Take the cooked pumpkin and add some to the top tray. Use the included wooden mallet to push the cooked pumpkin down the hole. This forces the pumpkin through the grinder and the bad stuff shoots out a little hole on the end. 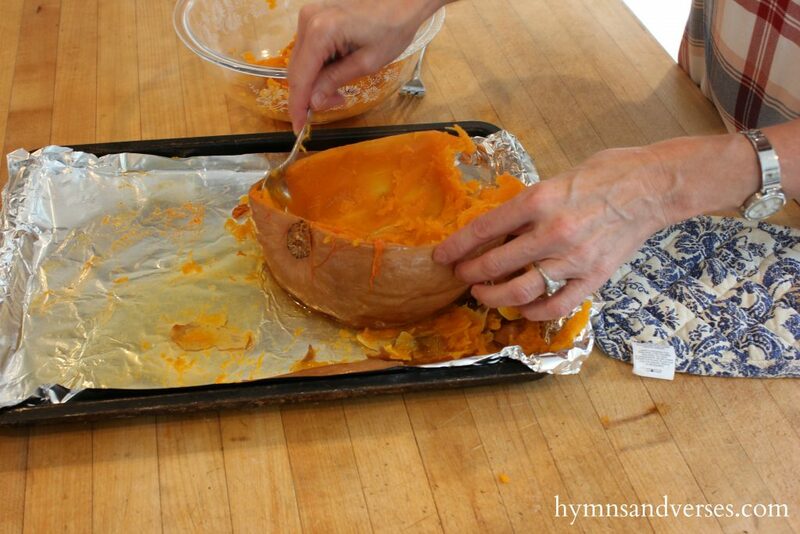 The pureed pumpkin comes out the bottom, so you need to have a bowl in your sink ready to catch it. The puree is smooth and and tastes amazing! I don’t think you can go back to the can after making your own! Now, if you don’t have the Food Grinder Attachment for your KitchenAid mixer, I read on Alton Brown’s Food Network page that he uses a food processor – I use the Ninja. This puree is great to have on hand for all of your fall and Thanksgiving pumpkin recipes!! Now, about those seeds that we saved! Don’t let them go to waste! After they are rinsed and dried, spread them on a cookie sheet and sprinkle with some fresh ground sea salt. Roast them in a 300 degree oven for 30 minutes until golden brown. Here they are fresh from the oven! Yum – they were delicious! 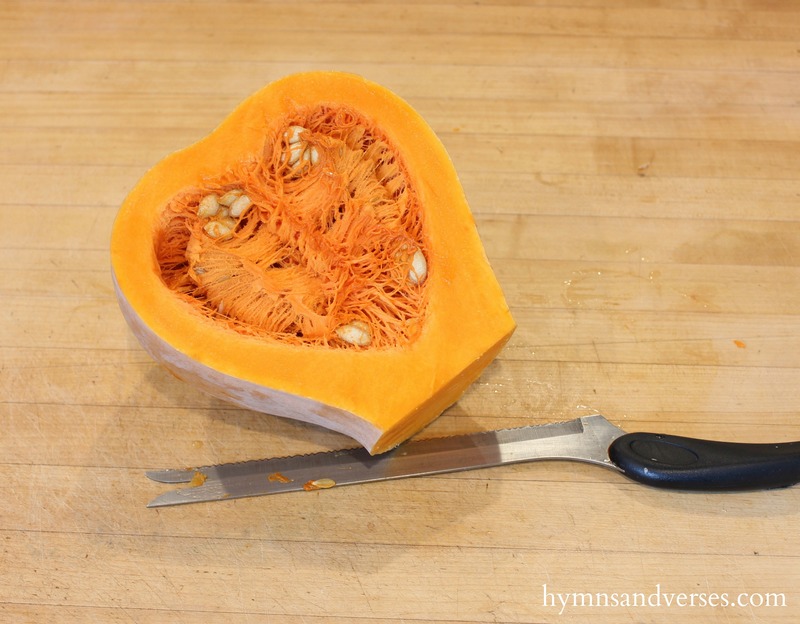 I hope you enjoyed this post and will give making your own pumpkin puree a try. 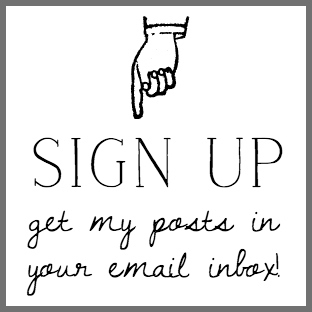 Better yet, have a friend over and make some together! You can snack on warm roasted pumpkin seeds, talk away the day, and make fresh pumpkin puree all at the same time! What could be better? Very interesting! You realize the vegetable you used was in fact a Butternut Squash, not the actual pie pumpkin. A pie pumpkin is similar and smaller than a Halloween pumpkin. However, my mom used to use squash all the time, for her pumpkin pies, and they tasted just fine. It’s the spices you add to make it. Enjoy your pureed pumpkin/squash.